Preparing the garden for a tour—part 6 of a series. illustrated – Johntheplantman's stories, musings, and gardening. There’s less than a week left until the day of the tour. The good news is that last week we started the fun stuff. 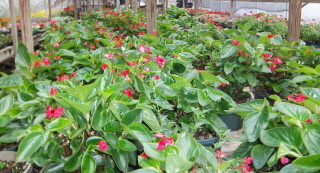 I went by the greenhouse to check out the dragon wing begonias. They were looking really good, so I loaded some in the truck and took them to the job site. There are a lot of urns to be planted in and around the back patio and pool area. We tried geraniums in these planters for a number of years but found them to be maintenance intensive. I love the dragon wings, though. They are low maintenance and provide dependable color. 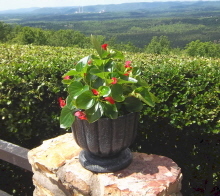 I planted one of the urns and stood back to admire it. While I was playing with the flowers, my helpers took on the field behind the pool. This area only gets mowed a few times a year because it is steep and not conducive to any machine other than a weed eater. They sure did a good job. 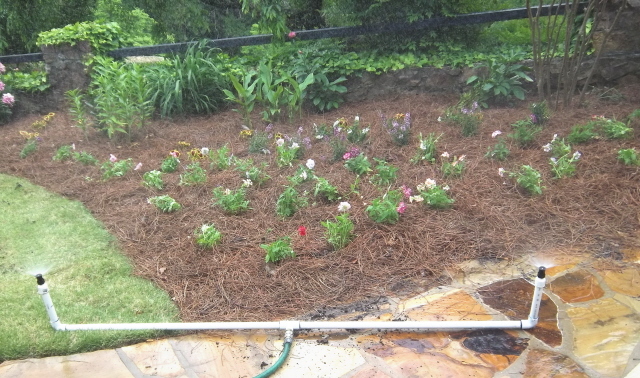 My job was to get the flower bed concept. 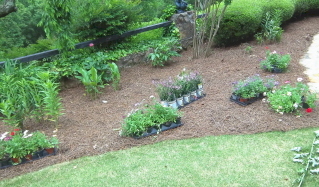 I had decided to use a mixed colors of verbena, coleus, and angelonia for the focus bed in front. 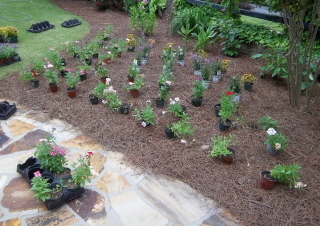 I laid out the trays of plants and stepped back to get a mental picture of what the beds would look like. The best way I have found to get a really good looking flower bed planting is to lay each plant out exactly where I want it to be. 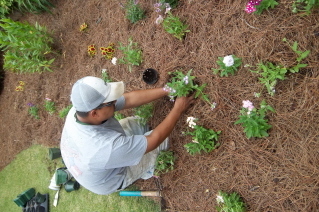 Then we go back and plant them, being careful to maintain the design. 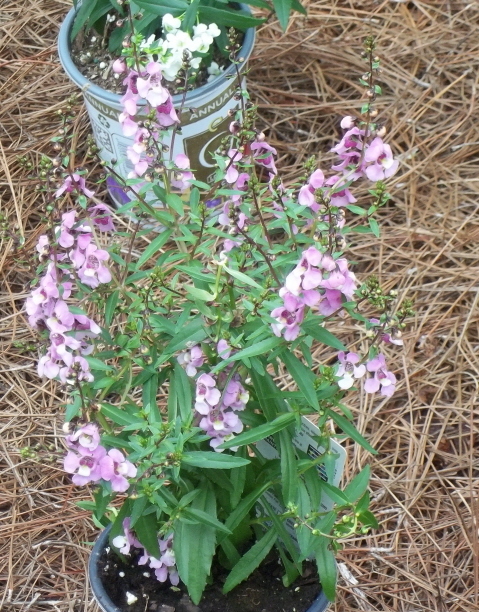 I used angelonia for something tall and bushy last year as a test and I really liked them. They gave me a bushy, floriferous statement behind lower plants. I highly recommend this plant for full sun. 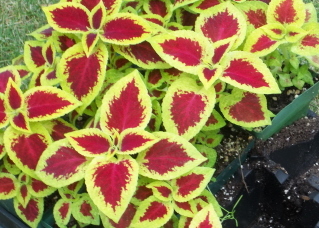 I found these coleus and I think they will make a statement and give some height to the rear of the garden. I love the color combination. Friday afternoon we carefully planted the flower bed. I like to use lots of time release fertilizer such as Osmocote. I’m going to have lots of fun next week– planting more flower beds, trimming and mowing, and tweaking the garden and its special areas. The Junior Service League of Rome is pleased to announce the first Rome in Bloom Garden Tour and the Twilight Blooms Garden Tour and Party on Saturday, April 28th 2012. Thank you to all of the above locations for your cooperation and support!! The Rome in Bloom Garden Tour is from 10 am to 5 pm and allows you to view six local gardens. Tickets can be purchased online, from a league member, or at the list of Rome locations below. The Twilight Blooms Garden Tour and Party is from 5 pm to 7:30 pm and showcases Rose Hill in Historic Downtown Rome. Tickets are $35 each and can be purchased online or at the list of Rome locations below. Both the Rome In Bloom and Twilight Blooms Garden Tour and Party are rain or shine. 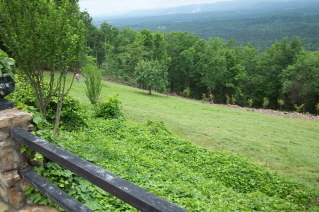 All tours are self guided and you are welcome to view the gardens at your preferred pace. Gardens can be viewed in any order but please be aware that the natural terrain could be uneven so dress accordingly. What beautiful work! You plan your colors and composition like a fine painting. No wonder the results are so amazing! That was a most wonderful unsolicited comment. Thanks, Mom. Good luck with the tour. Everything looks wonderful. Wish I were closer so I could see this in person. Angelonia is my favorite discovery from last year. It performed well through the summer and into October. I can almost feel as if I’m there,viewing those garden beds and planters with your descriptive details of what’s going where. Another artist from the Schulz clan to be appreciated.